This is the perfect class for anyone who knows nothing about Photoshop, or has used Photoshop for a little while, but needs to learn how to do more. We will take you from knowing nothing to editing your photos and images in about an hour. We will begin by taking a tour of the Photoshop interface, learning about all of the different commands, toolbars, and palettes. 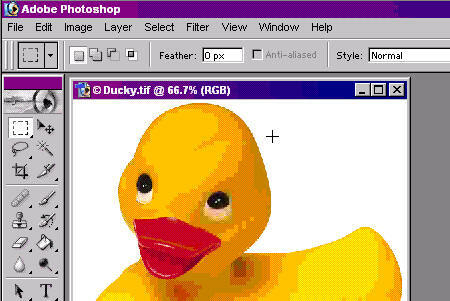 You will then learn how to open images, such as our friend Ducky here. Next, we'll learn how to create images from scratch, how to draw using the Brush tools, and how to change colors and brush shapes & sizes. Yes, I know this sample image doesn't look like much, but you'll learn a lot in this lesson! Next we'll learn how to load and work with existing images to do the types of things that you want to do with Photoshop. We'll learn how to remove shadows, undo changes, work with opacity, brush strokes, flow settings, spatter brushes, and more. 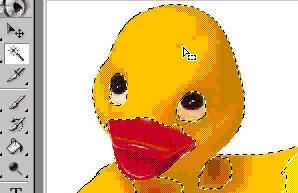 Here I've used an Airbrush with medium flow and 50% opacity to give Ducky some crazy hair. 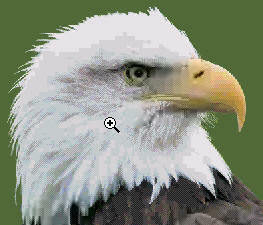 ...and change this eagle's eye to pink. Next we'll learn how to add text to our images. 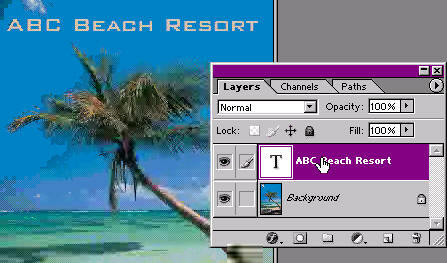 I'll then show you how to edit and transform the text, move it around the screen, rotate it, etc. You'll also learn how to work with Layers so that we can create a separate layer for our text. And of course we'll learn lots of different layer tricks - duplicating, hiding, etc. 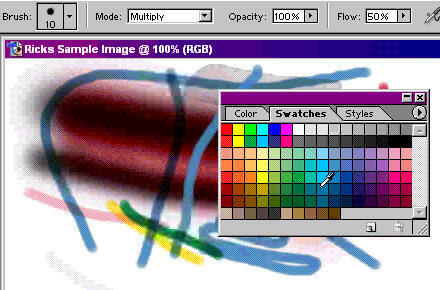 Finally, we'll learn about all of Photoshop's powerful selection tools. You'll learn how to make selections around parts of your image. I'll show you how to make simple rectangular selections. You'll learn about the lasso and magnetic lasso tools. And of course we'll learn about my favorite selection tool, the magic wand which is extremely versatile. We'll also talk about all kinds of selection settings, such as the magic wand's tolerance level, and how to select non-contiguous regions. I'll show you cut, copy, and paste, and a lot of other necessities. This is the perfect class for the Photoshop novice. If you've never used Photoshop before, or you're just getting started, don't miss this class. DONALD HOLDER on 11/4/2007: Whats the difference from "PSD" and "JPG"? Richard Rost on 11/6/2007: Good question. A "PSD" file is a PhotoShop Document file. It's a file that Photoshop uses for itself to store all of the information about your image including the layers, colors, etc. It's only viewable in Photoshop. It is NOT viewable in a Web browser or other graphics program for example. A JPG file (or JPEG) is a universal, standard image file. It is viewable on a Web page, and you can send it to other people who don't necessarily have Photoshop. A JPG is a "bitmap" file just like a BMP or GIF file. Basically, when you're working with an image in Photoshop, save it as a PSD file. When you decide you want to send that image somewhere else (email, web, etc.) then you export it as a JPG or GIF. Richard Rost on 11/9/2007: There are several ways you can do something like this. If you just want to add some basic color highlights to a B&W photo, just pick a brush, set the size and color to what you want, and maybe lower the hardness and/or opacity a bit lower and then start painting. First, take your color image and make look completely B&W: click on Image > Adjustments > Desaturate. This will remove all the color. Now, select the HISTORY BRUSH from the tool palette. This will allow you to paint over your image as it USED TO BE (get it, history). Just pick a brush style and start painting over whatever you want to restore color to in your image. This will create the kind of effect you see in movies or magazines where the picture is B&W but the apple the woman is eating is still red. Eric Patton on 12/23/2007: Great information. I have learned a lot!!!! Richard Rost on 1/5/2008: Thank you. Lori Walsh on 6/15/2008: These are the best lessons! Nice and slow and real informative!! Richard Rost on 6/17/2008: Lori, if you are using the Amicron Video Player, look in the bottom-right corner of the window. You'll see a little button labelled "<<<". That button will close up the Player a little bit ad hide the Forum screen. As far as making the lesson bigger goes, click on the "Play External" checkbox and that will load the videos up in Windows Media Player which you can resize as much as you'd like. i start viewing your graphics beginner course its so nice ∫eresting.My question is do I have to download grahic in my computer? Richard Rost on 1/19/2009: Nanett, all of the images used in Photoshop 101 are stock images that come with Photoshop. You do not have to download anything. Chuck Ballinger on 7/15/2009: Do you experience more loss if you are using JPEG vs. PSD? or is another format, TIFF, etc. more appropriate in certain circumstances? Richard Rost on 7/16/2009: PSD files will maintain all of the detail of your images. They're LOSSLESS meaning they don't compress the image at all, keeping all of the resolution. Keep your PSD files around until you're SURE you're done with the image. Then you can convert it to whatever format you want (I recommend JPG, but TIFF works OK too depending on the application). However, if you decide in the future that you need to make changes, you want to pull out the original PSD file because the JPG you made now has lost some detail. I don't have Photoshop in my computer so which version of Photoshop should I buy that will help me learning this program from 599CD.com? Thanks. Richard Rost on 7/25/2009: Vijay, my CURRENT lessons use Photoshop 7. However, I am going to be updating them soon for the latest version of Photoshop (CS4) as well as the latest Photoshop Elements. I'm looking to purchase your photoshop 101 tutorial, but I understand it's using Photoshop 7. Since I'm new at this, how much difference between CS3 and 7? Should I wait until you released the CS4 training? Richard Rost on 8/11/2009: Harris, there are a lot of new features from version 7 to CS4. However, the vast majority of the tools that I cover in my PS7 tutorials work the same in CS3 and CS4. In other words, my tutorial is pretty much backward-compatible. I have had people use my tutorials with CS3 and CS4 and tell me that they had no problems following along. I would recommend you pick up a copy of JUST my Photoshop 101 course and see if you have any problems. If you do, you can always invoke my MONEY-BACK guarantee and I'll either refund your $5.99 or give you a credit for when my CS4 class comes out (your choice). Tom on 2/11/2010: Is file browser a Photoshop 7 addition? I don't see the option in Photoshop 6. I believe it is, but it has been MANY years since I've used Photoshop 6, so I'm not sure. Jirair Kuyumjian on 10/1/2010: I cannot view the photoshop courses on my MAC. What should I do? Use the FLASH player in the Theater (switch from Windows Media Player to Flash in the options). You would have to purchase it from your favorite software store, online shop, etc. on 7/2/2011: What and how is the right plug-in that is required to get a photoshop 101 copy up on my screen? It should work with all versions of Windows Media Player. If not, try switching to the FLASH player in the Theater (option in the bottom left of the screen). Stan Anderson on 4/2/2015: I purchased 2 sets of lessons in 2015 - all went well. I recently purchased a new computer with windows 7. The person who sold it to me was supposed to transfer all of my software programs onto it - but did not for 599cd. I am not computer savvy but was able to install the 599cd Course manager and from that installed Photo Shop 101, 102 and 103. When I click on run a video screen appears but nothin happens. Help!! The AMV has been discontinued and is no longer supported.